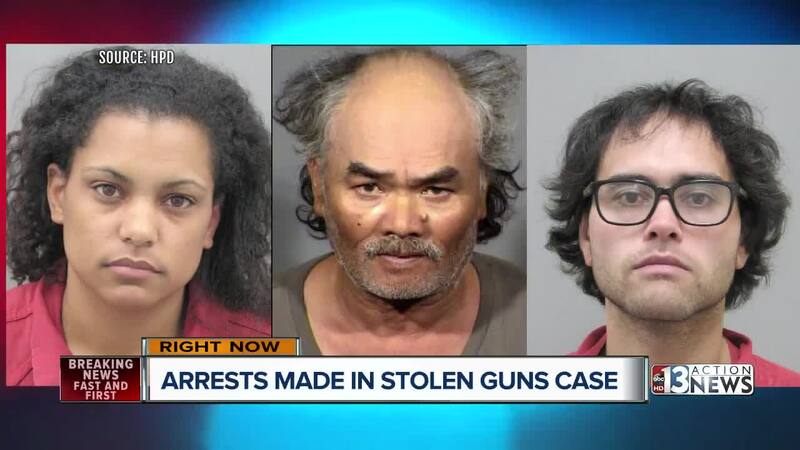 Three people have been arrested in the theft of a trailer containing hundreds of firearms from a Henderson casino parking lot. Henderson police in collaboration with the Bureau of Alcohol, Tobacco, Firearms and Explosives and Las Vegas Metropolitan Police Department completed an extensive investigation resulting in the arrest of three people believed to be responsible in a recent theft of a truck and trailer from Fiesta Henderson that contained numerous firearms and other property. Around noon Tuesday, Henderson police responded to Fiesta Henderson in regards to a truck and trailer stolen from the parking lot. Preliminary information revealed the trailer contained approximately 400 firearms along with ammunition and other property. Fiesta Henderson security released information that led law enforcement to identifying the possible suspects in this case. Due to the numerous firearms being part of the theft, ATF immediately joined in the investigation. As the investigation progressed and with the assistance of both ATF and LVMPD, information led law enforcement to the 7000 block of W. Washington Avenue, near Tenaya Way, in Las Vegas. Around 9:30 p.m. Wednesday, a search warrant was executed by the aforementioned agencies and the Henderson Police Department SWAT Team. 28-year-old Samual Donesing and 26-year-old Jaemillah Eagans were identified as suspects in the actual theft of the truck and trailer and were taken into custody without incident. Their charges were not disclosed. Due to the extensive list of stolen property, an updated count of firearms was closer to 300 but is under review. Henderson police said it appears that all of stolen firearms have been recovered with other stolen property, but further confirmation is required. They were booked into the Henderson Detention Center. No officers or persons were injured during the incident. Additionally 58-year-old Samlane Donesing, was identified and booked into Clark County Detention Center on a charge of conspiracy to buy, possess, or receive stolen property. Anyone with information in this case is urged to call the Henderson Police Department at 702-267-4911, 311, or, to remain anonymous, call Crime Stoppers at 702-385-5555 or visit Crime Stoppers website. 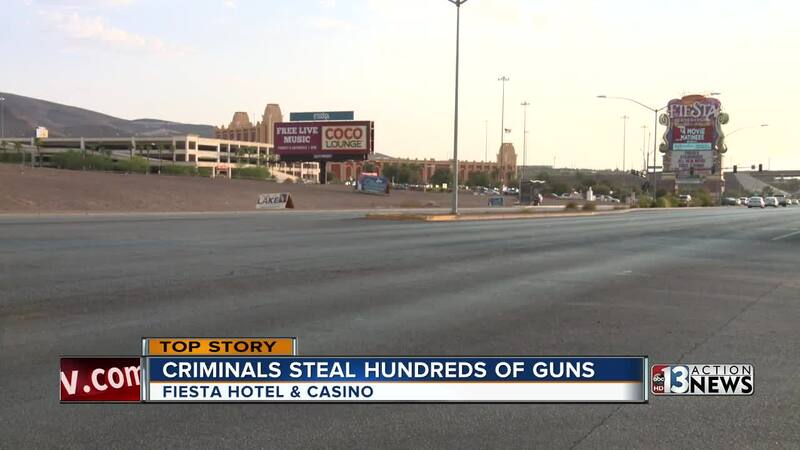 After the initial report of trailer theft on Wednesday, 13 Action News spoke with a retired Las Vegas police sergeant about the general problem of stolen firearms in Nevada. Retired Sgt. Richard Strader spent more than 20 years on the job with the Las Vegas Metropolitan Police Department. "My children grew up with me having guns," said Sgt. Strader. "They were always locked in a safe." Strader says we can all keep our community safer by securing our weapons. "You should never ever leave your weapon in a car unsecured ever," said Sgt. Strader.